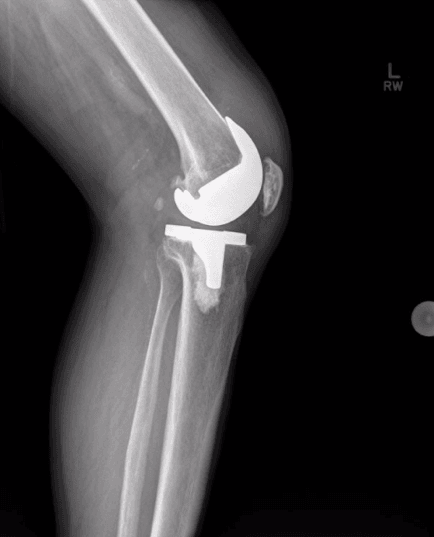 A 61-year-old male patient presents with sudden onset of intense knee pain 6 years after total knee arthroplasty. A positive alpha-defensin and high synovial CRP levels raise the suspicion of an acute periprosthetic joint infection. Further cultures reveal an extremely rare cause of infection in orthopaedic implants: Abiotrophia defectiva. The authors have no disclosures relevant to this article. 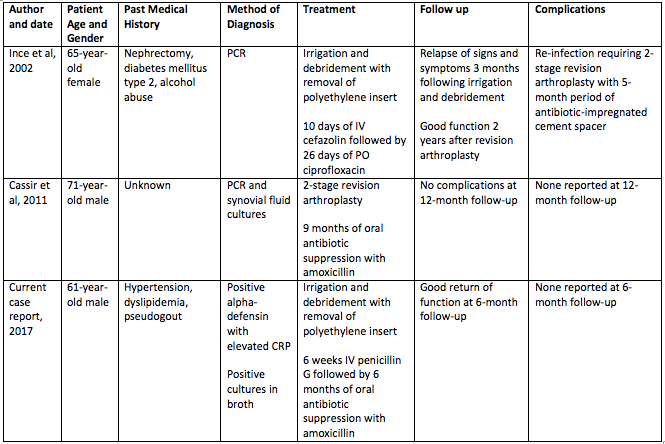 Very few case reports have linked this organism to orthopaedic implant infections (Table 1). 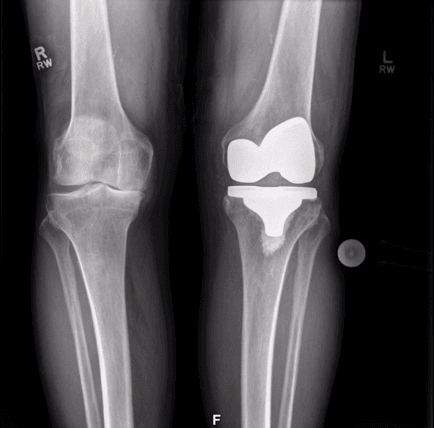 In 2002, Ince et al  documented the first infected total knee arthroplasty (TKA) due to A. defectiva. Cassir et al  then published the second report of infected TKA, but with different diagnostic and treatment strategies. In both case reports, definitive diagnosis could not be made without the assistance of universal polymerase chain reaction (PCR) testing. The aim of this case report is to document the third infected TKA due to A. defectiva and demonstrate our experience with this challenging organism. A 61-year-old male patient with a past medical history of dyslipidemia, hypertension, and pseudogout underwent left TKA in 2010 at our institution. He had no issues with the knee for 6 years, then suddenly experienced intense pain in the knee. One week later, he presented to our office for evaluation. His range of motion had rapidly decreased to 15 of flexion. He could ambulate without assistance, but he had required a cane for a few days following the onset of symptoms. He denied any recent trauma, history of infection, fever, or chills. Swollen left knee with palpable effusion. The patient’s erythrocyte sedimentation rate was 2 mm/hour (normal <20 mm/hour) and the C-reactive protein (CRP) level was 8.32 mg/dL (normal <0.80 mg/dL). The sample was prepared and cultured in aerobic and anaerobic environments for 14 days. The initial report showed no growth, but enrichment broth culture later was positive for A. defectiva. The sample was prepared and cultured in anaerobic and aerobic environments for 14 days; acid-fast culture was done as well and held for 48 days. Aerobic culture was positive for nutritionally deficient streptococcus species. Radiographs of the left knee show satisfactory alignment and positioning of components with no evidence of loosening (Figure 1). Figure 1. Anterior posterior, lateral, and sunrise views of the left knee taken following the onset of pain and decreased range of motion demonstrate acceptable alignment of components and no signs of loosening. Based on laboratory values and constellation of symptoms, the patient was suspected to have an acute PJI caused by hematogenous spread of A. defectiva from an unknown source. The patient was seen by our preadmissions personnel and medically optimized for surgery, and on the scheduled day, he was taken to the operating room for an incision and drainage with exchange of the polyethylene liner. Cloudy synovial fluid was extracted on aspiration of the knee joint just prior to the arthrotomy and then sent to the lab for culture. After thorough synovectomy, the polyethylene insert was removed. Extensive sharp debridement of the soft tissues was performed, removing all non-viable or grossly infected tissue. Three standard tissue samples were sent for culture. The patient was discharged on 6 weeks of intravenous penicillin G followed by 6 months of antibiotic suppression with oral amoxicillin, as recommended by the infectious disease team. The 3 cultures taken intraoperatively were tested in the lab. Broth cultures showed the presence of nutritionally deprived streptococci, and Gram smear showed evidence of gram-positive coccobacilli. Maxillofacial CT scan showed no evidence of abscesses, and chest x-ray and EKG showed no evidence of cardiac abnormalities. The transthoracic echocardiograph revealed normal wall motion and no valvular vegetation. Urinalysis showed normal urine pH, with no blood. It was negative for leukocyte esterase, protein, glucose, ketones, and bilirubin. At the 1-month postoperative follow-up, the patient presented with no specific complaints and had made excellent progress. Antero-posterior and lateral x-rays of the left knee showed satisfactory position and alignment of the components, with no signs of loosening. Physical examination revealed satisfactory wound healing and range of motion, with active flexion greater than 90. At the 3-month postoperative follow-up, the patient again presented with no significant complaints, although he reported that he’d had a short period of left knee pain localized to the medial aspect of the knee at approximately 10 weeks postoperatively. The pain resolved within 1 week. He had no symptoms of erythema, warmth, or effusion nor any recent history of infection or fall. Range of motion continued to improve. This is the third report of the species A. defectiva responsible for PJI, and it illustrates a more facile diagnosis than was seen in the prior 2 cases published in the literature. Identification of the infecting organism in PJI is crucial for using the most effective antibiotic treatment protocol for optimal eradication of infection. The positive alpha-defensin test and high synovial CRP level from the first aspiration led to a second joint fluid aspiration, with the culture and Gram stain identifying A. defectiva as the infecting organism before the broth result came back from the first aspiration. Although our patient had no complaints at his postoperative follow-up visits, long-term follow-up is required to ensure the infection has been eradicated. Rahul Goel, BA; Asim M. Makhdom, MD, MSc, FRCSC; and Matthew S. Austin, MD, are from The Rothman Institute, Philadelphia, Pennsylvania. Kawamura Y, Hou XG, Sultana F, Liu S, Yamamoto H, Ezaki T. Transfer of Streptococcus adjacens and Streptococcus defectivus to Abiotrophia gen. nov. as Abiotrophia adiacens comb. nov. and Abiotrophia defectiva comb. nov., respectively. International journal of systematic bacteriology. 1995;45(4):798-803. Ohara-Nemoto Y, Tajika S, Sasaki M, Kaneko M. Identification of Abiotrophia adiacens and Abiotrophia defectiva by 16S rRNA gene PCR and restriction fragment length polymorphism analysis. Journal of clinical microbiology. 1997;35(10):2458-2463. Bouvet A. Human endocarditis due to nutritionally variant streptococci: streptococcus adjacens and Streptococcus defectivus. European heart journal. 1995;16 Suppl B:24-27. Cerceo E, Christie JD, Nachamkin I, Lautenbach E. Central nervous system infections due to Abiotrophia and Granulicatella species: an emerging challenge? Diagnostic microbiology and infectious disease. 2004;48(3):161-165. Frenkel A, Hirsch W. Spontaneous development of L forms of streptococci requiring secretions of other bacteria or sulphydryl compounds for normal growth. Nature. 1961;191:728-730. Ince A, Tiemer B, Gille J, Boos C, Russlies M. Total knee arthroplasty infection due to Abiotrophia defectiva. J Med Microbiol. 2002;51(10):899-902. Cassir N, Grillo JC, Argenson JN, Drancourt M, Levy PY. Abiotrophia defectiva knee prosthesis infection: A case report. Journal of medical case reports. 2011;5:438. Deirmengian C, Kardos K, Kilmartin P, Cameron A, Schiller K, Parvizi J. Diagnosing Periprosthetic Joint Infection: Has the Era of the Biomarker Arrived? Clinical orthopaedics and related research. 2014;472(11):3254-3262. Deirmengian C, Kardos K, Kilmartin P, Cameron A, Schiller K, Parvizi J. Combined measurement of synovial fluid alpha-Defensin and C-reactive protein levels: highly accurate for diagnosing periprosthetic joint infection. The Journal of bone and joint surgery. American volume. 2014;96(17):1439-1445.